Full disclosure: I did not want to write a pickleball story when the idea was first pitched to me. At the time, I knew next to nothing about the sport. I knew it was sort of like tennis, and I remember seeing a notice about it at the senior center on Monroe Street. 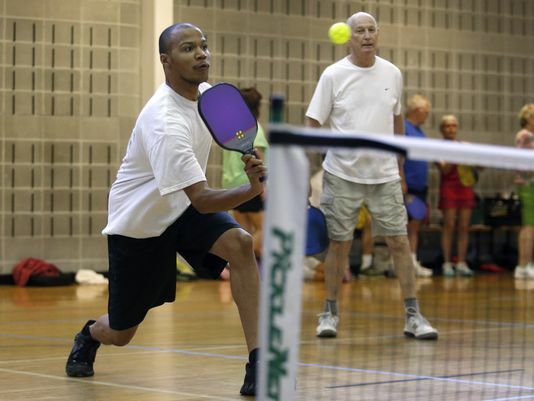 I looked up a few videos on YouTube, did a Google search, saw there is a national organization dedicated to pickleball and – after repeated emails from my boss – figured, "Well, what's the worst that could happen? Might as well write the story." I still didn't see what all the fuss was about. I contacted LaRae Donnellan, set up a time to play a few rounds at Premier Health and Fitness and decided to schedule a story for Monday, when we run community features in the sports section. Donnellan was all smiles when I arrived at Premier. I'm guessing it's because she knew she was about to run circles around an unsuspecting journalist. She led me to the courts where other players were already in the middle of games – it was 9 a.m., by the way – and gave me a basic rundown of the rules.